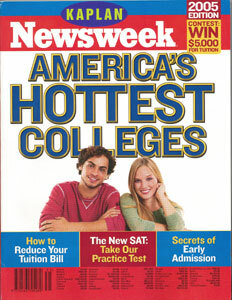 Kaplan/Newsweek's 2005 "How to Get into College" guide offers advice for a changing admissions landscape. New York, August 10, 2004 – For high school students, the past year has been a particularly eventful one, characterized by a new SAT, changing early decision policies and a shifting economic and political arena. The 2005 Kaplan/Newsweek "How to Get into College” Guide reflects the changing and increasingly competitive college admissions landscape featuring a list of“America's 25 Hot Schools” that recognizes areas such as practical job-centric programs, schools that embrace and cultivate diversity, emphasis on quality of life issues and, in this politicized environment, schools with a military bent. Designed to provide families with insight into the college application process, the guide contains essential admissions strategies, revealed in such articles as“The Write Stuff,” a before and after look at a college essay, and“Safety First,” which provides perspective on drawing up the ideal list of schools.“Surviving the New SAT” arms students with the information they need as this new admissions hurdle becomes a reality in March, 2005.“Helping Hand” profiles an organization that provides opportunities for low-income students, while“Diversity 101” focuses on race and affirmative-action policies. The guide also explores the latest on a variety of perennially popular campus life topics ranging from cafeteria cuisine to high tech roommate pairings to health and safety issues. This year, Kaplan/Newsweek has launched an expanded“Hot Schools” list in the guide, based on admissions trends and extensive interviews with a broad array of educators, admissions officers, students and other longtime observers of the admissions process. The applicant pool for each of these schools has grown much stronger in recent years – not only in sheer numbers of students applying, but also in test scores, grades and extracurricular accomplishments. And although all these schools have demonstrated continuing excellence, various qualities made many stand out in 2004. This year's“Hot Schools” deserve individual recognition for their choice attributes, such as specialty programs, state-of-the-art facilities or comprehensive financial-aid packages. Dream schools come in all shapes and sizes and the guide spotlights stand-out gems – public and private, small and large, liberal arts and tech-focused – that students and parents want to know about. The "Hot Colleges" list was featured on CNBC's "Power Lunch" program on Wednesday, August 18. Haverford was among only a small handful of the 25 "Hot Colleges" included in the segment.